Yesterday, after a fairly successful (and fun!) yard sale and a surprise visit from some pretty awesome friends, Kaitlin and I made our way to the Silver Creek Christmas Tree Farm to pick out our very first Christmas Tree. Upon arriving, we were quickly greeted by the friendly staff, given a saw and a measuring stick, and headed out towards the countless rows of leyland cypress and white pines. We quickly found this not to be an easy endeavor. For about half an hour we searched, frequently running into nearly-perfect trees, only to find bald spots when we circled them. Some would be great from one angle, but just not that great from everywhere else. From far away, many looked promising, only to disappoint us when we finally reached them. In hindsight, we were probably very unfairly critical and judgmental towards these trees. When we finally realized that we were not going to find an 8 feet tall tree that was unfailingly symmetrical and branch-y from top to bottom, one called out to us, and we knew it was just right. I took the provided hand saw and started cutting. This became quite tiring in no time at all, especially having gotten up at the break of dawn to start our yard sale earlier that morning, and having to use a saw that was dull from hundreds of uses. In about a minute or two, it finally hit the ground and we started dragging it back. We didn’t get far at all before one of the staff came rolling along in a tractor pulling a trailer that he offered to pull the tree in. I snapped a photo of Kaitlin, and then he snapped one of the both of us, which was nice! Note how beautiful she is! A little blurry, but it was a phone camera. They drove it up, wrapped it, and tied it to the top of the Nissan Altima while we ran into John Moore (the college minister of West Rome Baptist Church) and got to have a brief chat about Christmas trees and exchange belated congratulations (he recently had some additions to his family, and we got married (in case you didn’t know)). On the way back a whole-in-the-wall BBQ restaurant caught our eyes. Those are the best kinds, so it was very exciting. Upon closer inspection, however, we found that they were closing, which was extremely unfortunate. We went to Shane’s instead. There, we ran into two other friends, who just so happened to be UGA fans and were headed to continue watching the game. We put our college football loyalty differences aside and enjoyed a little fellowship before they left. Anyway, back to the tree. 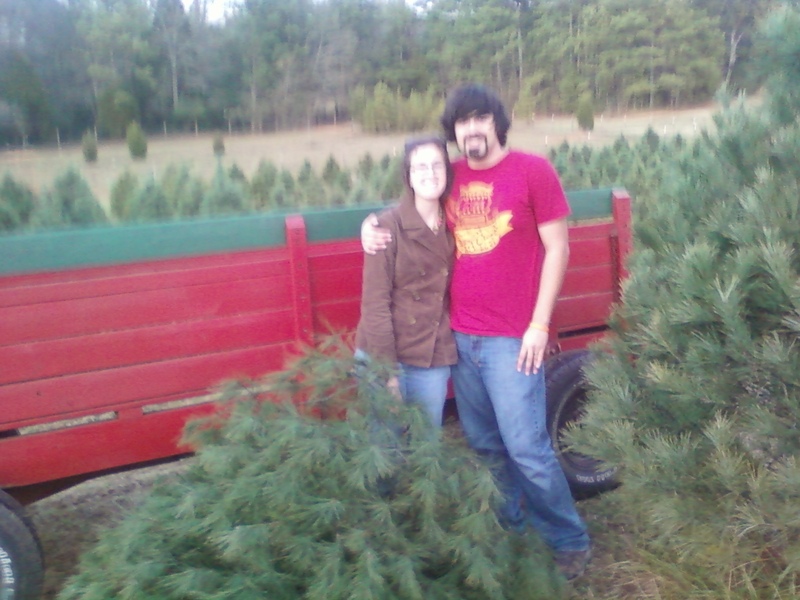 We soon discovered that there is more to putting up a tree than just cutting it down and bringing it home. It has to fit into the stand. That was not happening. Some of the bottom branches had to go. Out of desperation, I tried some pretty stupid things like a box cutter and a steak knife. 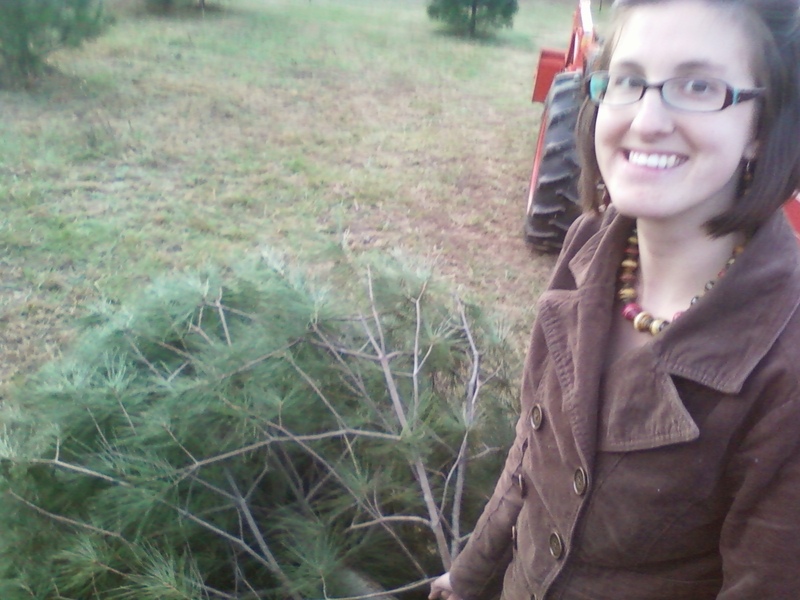 The branch of the pine yielded to neither. Meanwhile, Kaitlin is trying to hold up the tree and balance it on the little part of the stand that the tree can sit on, with a few close calls when it leaned a little too far for comfort. This wasn’t going to work. We needed a new plan. 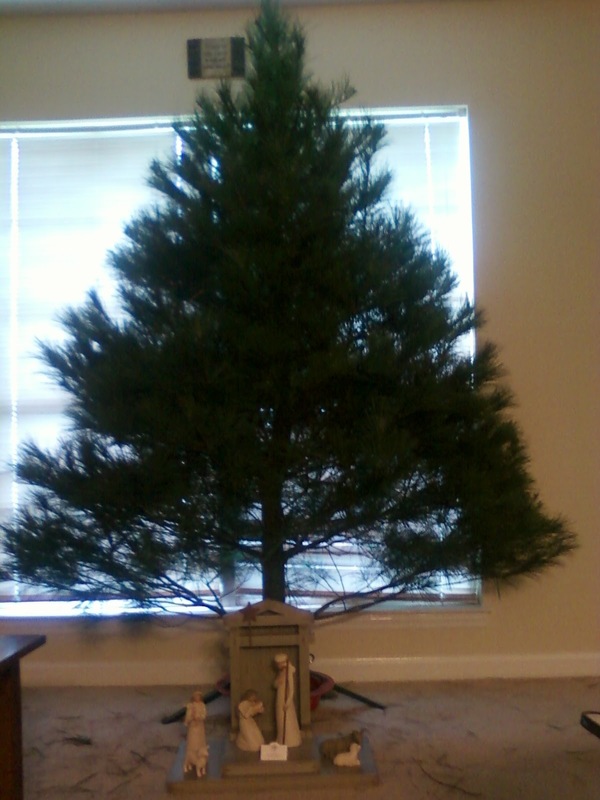 I carried the tree outside so it wouldn’t cause any more mess in the house, and drove to Wal-mart to get a heavy-duty clipper. After rushing back home, I hopped out of the car and quickly started to clip those stubborn branches off. Finally, we got it into the stand and tightened the screws. My cutting job was not very straight, and the tree itself was not perfectly straight. This made it a little harder to work with, but we finally got it to stand without leaning and though the bottom looked a little naked after the trim, we were very proud of ourselves. Our tree! I added our Nativity scene today. It’s from Willow Tree and it’s so awesome! There is just something about having the tree up that makes Christmas feel so much more closer. I’m so excited about our very first Christmas! Just looking at the tree awakens that excitement and makes me so thankful to God that He has blessed me with such an incredible life, wife, and home, and that He loves us so much that He left His throne and became the Son of Man that I (and you and you and you and even YOU) may be saved by the grace shown through His death and Resurrection. It has become so cleche, but in the mess of it all, let us not ever for a moment this year forget that we are not gathering in the name of capitalism or materialism, but in the name of Jesus, Son of the Living God. Merry 21 days before Christmas, everyone! Great post, Zack! For starters, bonus points on not going the direction I originally thought: this is where you would have compared your tree search to how many things in life look good until you get close enough to them and realize differently. (For the record, I am capable of such posts, lol.) Second, why did you have to take the tree to Walmart with you? Third, the Willow Tree nativity is a great touch! And finally, it sounds like you and Kaitlin are already off to an amazing first Christmas! Matt, thanks! It's going to be a great Christmas! It's good to hear from you! Sorry for the confusion. The way I worded that was weird. I threw it on top of Kaitlin's car, and then drove mine to Wal-mart. Looking back, throwing it on her car was probably unnecessary, but I wanted it elevated for a better cutting angle!